My mouth was agape for much of The Eyes of My Mother. Borrowing from horror yet far from it, this film by director Nicolas Pesce disturbs the emotions that accompany our love for our family—our mothers, our fathers and our children—with violence and morbidity. Francisca’s (Kika Magalhães) mother (Diana Agostini, The Godfather: Part III) was an eye surgeon in Portugal before living in the United States on a ranch with their family. She teaches Francisca how to perform minor surgical procedures on dead cows (the way she learned in Portugal). While Francisca’s father makes his way back home from work, a man posing as a salesman drops by to use their bathroom. Once inside, increasingly aggravated, he demands that Francisca’s mother accompany him to the bathroom where he brutally murders her in the tub. Francisca’s father returns to find him pounding at her mother’s body, and he knocks him out and takes him captive in their barn. There, chained, he asks Francisca if she will kill him. She says she won’t because he’s her friend. Francisca begins to follow in her mother’s footsteps as a surgeon of sorts as she matures into a woman. Mostly alone on their family’s property, she copes with the legacy that her mother has left in her heart and yearns for companionship without the social faculties to achieve it. Despite this deficiency, she presses on to arise out of this abyss of lonesomeness in her soul, but with Icarian results. As she forces herself onto others, their reluctance invokes her knife, needle and stitching finesse. Pesce employs unsettling images in The Eyes of My Mother. Despite the fact that we do not see any violence occur beyond a needle puncturing skin for sutures, sound effects suggest heinous acts of murder and mutilation. Most frightening is what my mind pieced together when victims would appear with their eyelids sewn together. What’s more, Pesce shot The Eyes of My Mother in black and white, recalling Alfred Hitchcock and, particularly, Psycho. This technique, for me, lends the film its spectral countenance and emotional desolation. The dialogue is bare—Magalhães executes a haunting deadpan that stiffens Francisca’s exchanges with other characters. 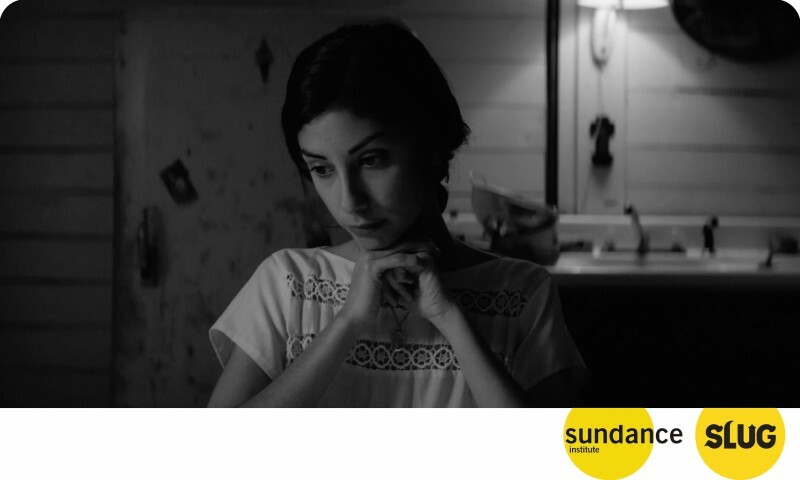 Most of the film transpires at Francisca’s family home, which imprisons us and helps Pesce contain the film’s logic as to reflect the psychological portrait of Francisca, which enables her to operate as a monster. The Eyes of My Mother exhibits only the most tactful of horror tropes, and successfully resists becoming a slasher flick. Pesce and his team cut the film in a way where a scene may seem to be missing a logical follow-through, compiling somewhat disjunctured images. These images, in turn, comprise the film’s narrative clockwork, amounting to a story that Pesce must tell visually. Additionally, silence pervades the bulk of the film, which makes the songs in the score by Amália Rodrigues especially poignant as Francisca dances with her father and, later, herself, wearing white. The Eyes of My Mother is not easy to watch—nor should it be. Pesce made a clear choice to disorient us by presenting depraved and gruesome acts performed blithely but artistically. In doing so, The Eyes of My Mother made me feel a sense of aesthetic solace because the heart-crushing violence is so devastating. It’s this emotive contradiction that elevates this film above others. You, too, should look through the eyes of its needles—this is the stuff of Sundance.